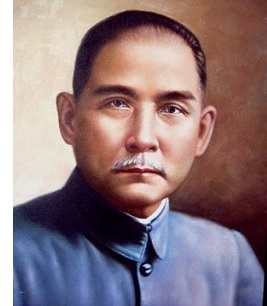 Sun Yat-sen (1866-1925) - In China's entire history, from its foundation up until the early 20th-century, the country had been ruled by emperors who had complete control of the government. That finally changed in 1911 with the Xinhai Revolution. The winds of revolt had been swirling for years as several attempts to overthrow the Qing Dynasty had occurred over the previous two decades. Dissatisfaction with imperial rule had been rampant as the majority of Chinese people lived in squalor. There had actually been two revolutions in 1911. The first in April failed; but the second one, known as the Xinhai Revolution, in October finally succeeded. Both of them were led by a man named Huang Xing. Sun Yant-sen had been in exile in Japan, but returned upon the overthrow of Emperor Puyi (who was just a child). Huang Xing was a military leader, though, not a political leader; and when China's provisional democratic government was organized at the end of 1911, Sun Yat-sen was the man elected president. On January 1, 1912, the Republic of China was born. A constitution was written and a legislative body established. It's interesting to compare Sun Yat-sen to Vladimir Lenin, both of whom led revolutions at roughly the same time. Lenin was a socialist who was greatly influenced by the ideas of Karl Marx. Sun Yat-sen was influenced by American Democracy. He spent a significant amount of time in the United States, studying its culture and its government. Unfortunately, a side by side comparison on the development of the two systems is not possible due to the fact that Chinese democracy did not last long. Yet another revolution took place in July 1913 which overthrew the republic in favor of a short-lived restoration of the monarchy. A man named Yuan Shikai proclaimed himself the new emperor, and Sun Yat-sen was forced to flee the country once again. Shikai was unable to maintain power, though, and the country splintered into several factions. Sun Yat-sen returned in 1917 and tried to reunify China. In order to do so, he formed an alliance with China's communist party (which ironically won the praise of Lenin). His goal was to return to power, and he succeeded in 1924, but died a year later. He was succeeded by Chiang Kai-shek.